Mark was born in North Bay, Ontario in 1965. From 18 to 22, he studied Mechanical Engineering at Queen's University in Kingston, Ontario. After earning his degree, he studied Jazz Trumpet at McGill University in Montreal. He then worked as a mechanical engineer for Liquid Air Engineering. In 1989 he went back to McGill to study Music Education. After acquiring his certificate to teach high school music from McGill, he travelled the world on cruise ships, playing trumpet in the orchestra. In 1998, he settled in Ottawa to teach high school music. There he joined the Piano Technicians Guild and began his studies to become a Registered Piano Technician. (Jan 2005) It is there that he founded Mr. Tuner Piano Service. After three years in Ottawa, he moved to Montreal where he taught music and tuned for three years before becoming a full time piano tuner. He now has three technicians who work with him to help tune his customer's pianos. 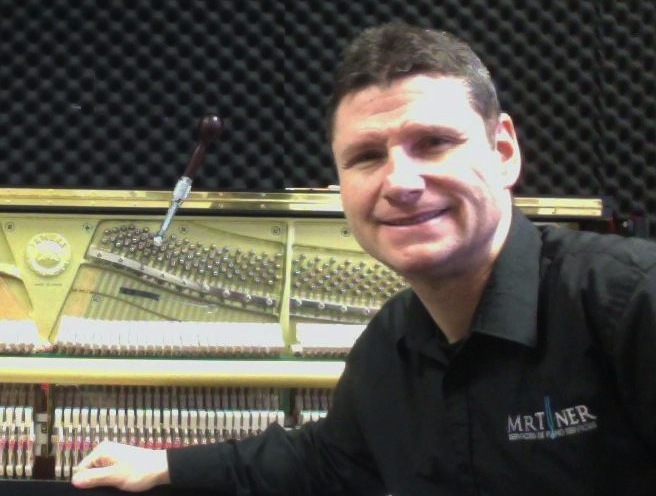 In 2006 he founded the Mr. Tuner Piano Technicians school in order to train technicians and to continue his love of teaching. The school graduates approximately 20 students per year from the basic tuning and repair courses. Two of those students are now tuners for Mr. Tuner Piano Service and many others successfully tune their own pianos. In Montreal, the piano tuning and repair courses are taught at Westend Pianos in Montreal West. Westend Pianos is a well respected piano rebuilding facility that is owned by Doug Yeats, who is also a Mechanical Engineer. The facility is recognized as the premier rebuilding facility in Eastern Canada. There are three floors in the building that are used to give students the opportunity to practice their tuning in isolated areas which aids in hearing the notes better. Mark tunes purely by ear and uses a double (open) unison, soft pull, soft blow technique which produces very precise and stable tunings. The double unison technique allows the technician to easily hear when unisons have drifted, allowing for corrections and resulting in very few, if any, out of tune unisons at the end of the tuning. The double unison technique also minimizes the effect of settling unisons which can happen when one string is tuned to an interval and then the other two unisons are tuned to the first string. The soft pull hammer technique produces consistant stability and the soft blow technique reduces hearing loss. These techniques have been developed and perfected by Mark, although other high level technicians use some combination of similar techniques. Click Here for more information on piano tuning and repair course dates, times, and fees.